PLYMOUTH, Mich. – Camp Casey is one of 60 admirable organizations to receive a 2014 Summer of Sharing donation from Community Financial Credit Union. Founded in 2004 and based in Royal Oak, Michigan, Camp Casey is a nonprofit horseback riding program for children with cancer. 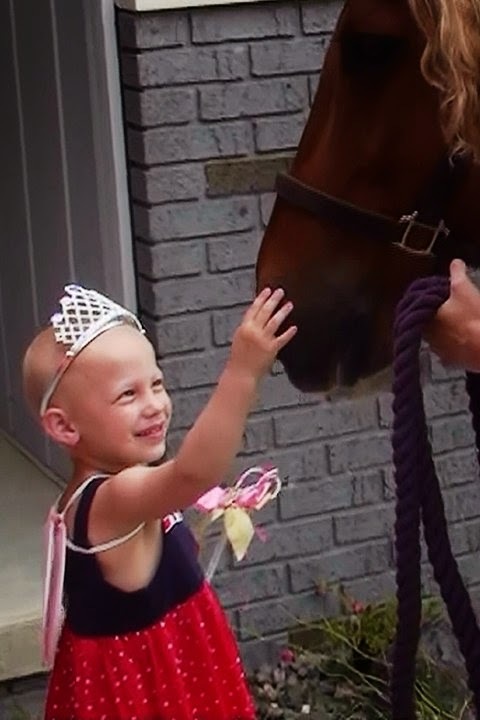 Through donations and volunteers, Camp Casey spreads the healing power of horses to families facing a pediatric cancer diagnosis. Community Relations Director Jessica Leroux said the opportunity to receive a donation from Community Financial was very exciting. “We were all so happy when we found out we had received a Summer of Sharing donation,” Leroux said. Leroux revealed that the donation from Community Financial will fund an entire Horsey House Call for a child with cancer. 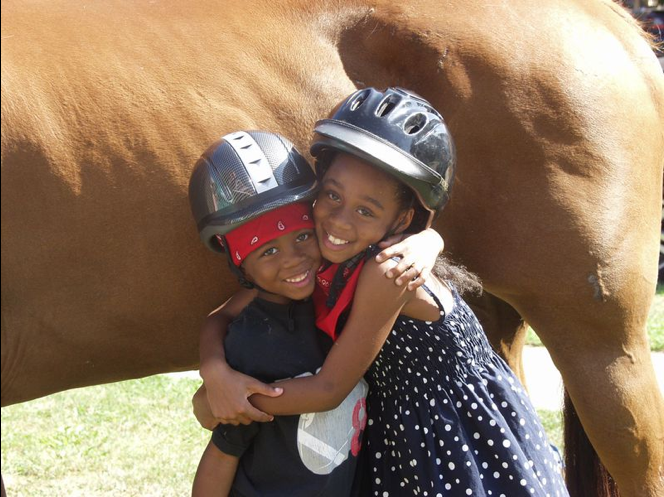 Camp Casey strongly believes in the healing power of horses. Leroux explained that when a child with cancer has the ability to sit on a giant animal and command it to walk and halt, the child can bring that “in charge” confidence back to the hospital. Leroux and the rest of the team at Camp Casey make 15 to 17 Horsey House Calls during a summer season. Community Financial is proud to have funded one of those events. During the Summer of Sharing, Community Financial gives away $1,000 a day for 60 days to organizations that are making a difference in the communities it serves. Headquartered in Plymouth, Michigan, membership in Community Financial Credit Union is open to anyone who lives, works, worships, or attends school in 23 Michigan counties. With more than 50,000 members, Community Financial provides financial services to members at 10 branch locations and through a variety of automated and online services. For more complete membership information, visit www.cfcu.org or call (877) 937-2328. 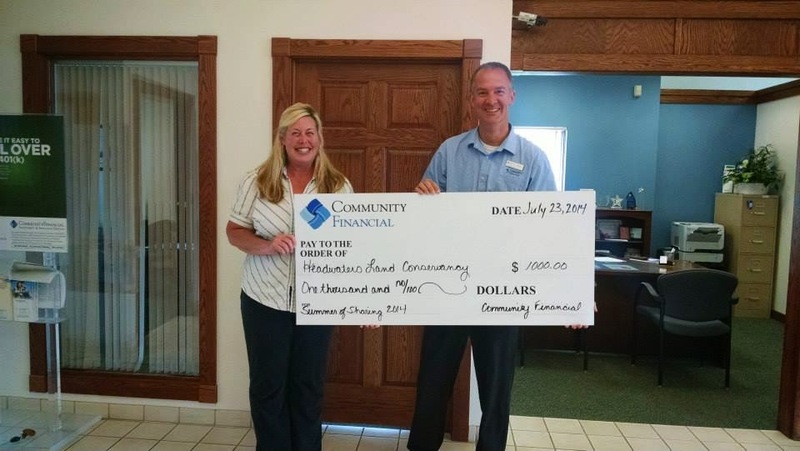 GAYLORD, Mich. – The HeadWaters Land Conservancy is one of 60 admirable organizations that has received a Summer of Sharing donation from Community Financial Credit Union. Based in Gaylord, HeadWaters is a nonprofit organization that protects 80 conservation easements throughout 11 counties in Northeast Michigan. Laura Justin, executive director of HeadWaters, explained that having the opportunity to receive a donation from a fellow local organization was very exciting. Justin said that when she found out she was a recipient of a Summer of Sharing award, she let out a small excited scream like she does every time she receives a grant, and then immediately sent an email to the board to let them know the good news. Justin, others on her staff and the board at HeadWaters use donations like the one from Community Financial to cover the costs of the monitoring visits they take to examine conservation properties. Justin and the rest of the team at HeadWaters are extremely passionate about the work they do in Northeast Michigan. “It is having the privilege to meet with so many people that care so deeply for their land and will show you every single tiny, amazing thing that they love about their land that makes me so excited about my work,” Justin said. Justin elaborated on how she could tell that Community Financial team members of the Gaylord branch had a nice appreciation for where they live and they really appreciate the HeadWaters mission. “Community Financial and HeadWaters are both local organizations helping the public at large,” Justin said. 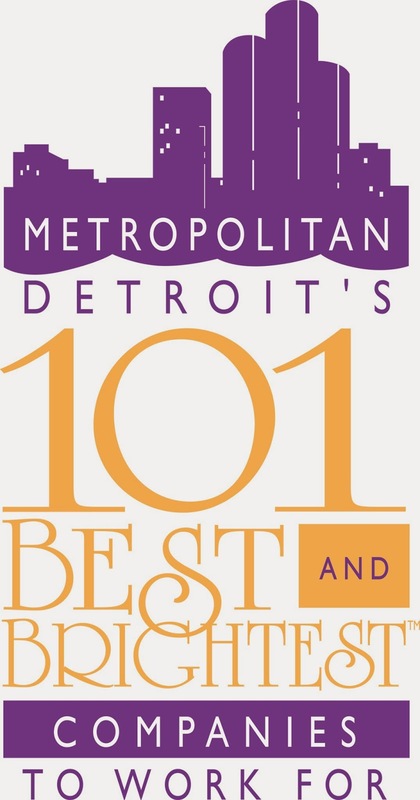 PLYMOUTH, MI - Community Financial Credit Union has been named one of Metro Detroit’s 101 Best and Brightest Companies To Work For™, the ninth year in a row for this honor. This award recognizes companies for excellence in human resources practices that create exceptional work environments. Awards are based on detailed questionnaires completed by nominated companies and their employees. Companies provide information about work place communication, work-life balance, employee education, diversity, employee recognition, retention and other elements of the work environment. The 2014 award competition included 1,000 nominations and more than 500 applications. All of the companies that participate receive reports that compare their human resources practices with an aggregate of other companies’ data. “This award depends in large part on data collected from Community Financial team members and we appreciate their recognition of Community Financial as a great place to work. We participate in this program as a way to help attract and retain the best team members to fulfill Community Financial’s purpose of enhancing the financial well-being of every member,” said Kathleen Hinchcliff, Manager/Education and Development, Community Financial Credit Union. Community Financial Credit Union is headquartered in Plymouth, Michigan and is federally insured by the NCUA. Membership is open to anyone who lives, works, worships, or attends school in 23 Michigan counties. With more than 50,000 members, Community Financial provides financial services to members at 10 branch locations and through a variety of automated and online services. For more complete membership information, visit www.cfcu.org or call (877) 937-2328.